Our Community Board is up on our website. 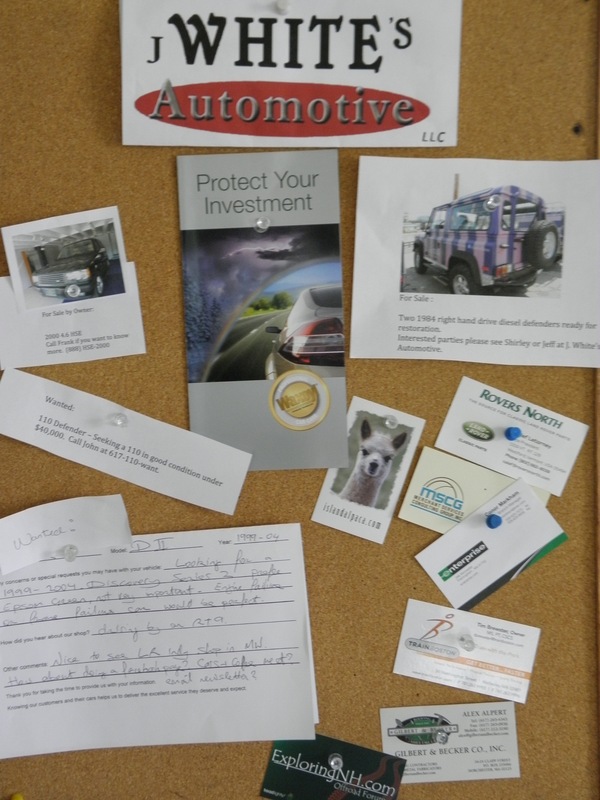 Our community bulletin board is open for all customers to use to share information, offer items for sale, seek items, etc. Shoot us an email if you would like to post on the new board and we will be happy to assist you. If you are going selling your Land Rover send some photos along with your details! If you want to know who we are and how we operate before giving us a try, we hope you will take the time to read this post. The words in today's blog posting were drafted as a response to one of our Landrover repair customers who faced a rather large repair estimate and asked us if we would be offering her discounts. We work hard every day to build our small business in a big location, but if we give our work away, we would have to become a business that is very different than who we strive to be or even worse, not be profitable and eventually not be there for the large customer base that has come to rely on us. After drafting a response to this customer's inquiry, we decided that it encompassed the essence of our business. If you want to know who we are and how we operate before giving us a try, we hope you will take the time to read this post. We are a for profit business: We can't be here for you if we don't make money. We offer value, personal and professional service. We take care in who we hire and who will work on your car. We do not aspire to compete with box stores. If bottom line prices is what you seek, we can't compete. If quality and personalized service is what you seek, please give us a try. If you compare the cost of a dealership's per hour rate, I think you will agree that our rate is discounted. We understand how hard it is to pay for automotive repairs, especially those that are unexpected. We relate to what our customers are feeling most when we go to the dentist and find out we will need to pay him $1,500.00 for a root canal. We don't want to go through the inconvenience of having to go to his office for the root canal, we would rather use the money for a vacation, but we need our teeth to work, we trust our dentist, so we get the root canal. The biggest similarity that we try to recreate with our dentist analogy is that we try to make the repairs as pain free as possible. We do everything we can to make the experience as pleasant as possible. We take care in hiring the best technicians possible. They are qualified, seasoned professionals who care. They don't work flat rate, their work is measured not be speed or production, but by quality. That is what our circle of customers has come to appreciate. Good technicians do command higher salaries than those who work for the box shops, but like with a dentist, our customers don't really want to go to somebody that "might not know what they are doing". We hope that you will give us the chance to earn your trust and can promise you that with every visit, we will strive to never let you down on the quality and service we deliver. We will offer you the best value we can always, but will not sacrifice quality to offer a lower price than other shops because the corners that we would need to cut to do so, would not allow us to deliver the quality and service that has allowed us to retain and attract new satisfied customers and their referrals year after year. PS. If you are interested in a referral to the most amazing dentist, we would be happy to recommend ours. Owners and keepers of J. White's Automotive.